If you are a Seattle homeowner contemplating a bathroom remodel, you may be wondering if you will need to permit your project. The answer is probably. Even though your bathroom is one of the smallest rooms in your house, it has several systems that often do require permits to change, such as plumbing and electrical. 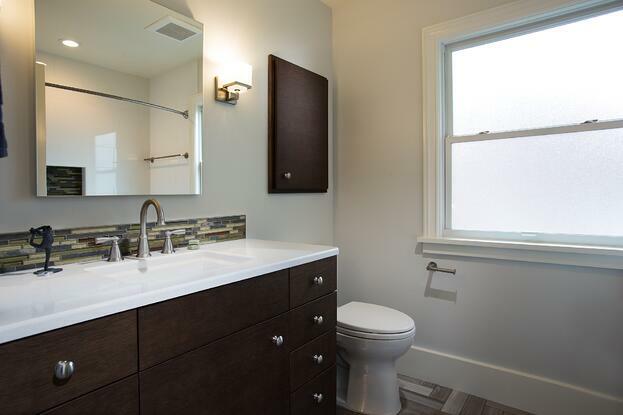 Even if you are just planning a relatively cosmetic bathroom remodel, you should still check with the Seattle Department of Planning and Development before you get started. You don't need a permit for minor repairs or alterations that cost $6,000 or less in any 6-month period. The $6,000 limit is based on fair market value of labor and parts, even if you do the work yourself. You need a permit for any work on load-bearing supports, changes to the building envelope, and work that reduces egress, light, ventilation, or fire resistance no matter how small the project. Why the exception for projects under six grand? This may not be the city's official answer, but it could be because the King County Property Assessor is interested to know if you are making valuable improvements to your home, which would raise its value. For a bathroom remodel, there are some grey areas. If you are just replacing your vanity, sink, and toilet, and the total cost of the project is under $6,000, you might find that you don't need a permit. This is especially true if your new plumbing fixtures, like your sink and toilet, are connecting right to the existing lines, and you aren't moving or adding any electrical outlets. In almost every circumstance, doing a full remodel of your Seattle bathroom will require permits and a full series of inspections. Notice that "permits" is plural. Let's dive into each of these and explore why you need them and who will be inspecting your work. While you might be able to get away with not getting a plumbing permit if you're just swapping out your faucets and toilet for new ones, you most certainly need one for the type of plumbing work that takes place in a major bathroom remodel. For instance, many old tub drains in Seattle homes are only 1.5", whereas code now requires a 2" drain. If you're replacing your tub, you'll need to upgrade to a 2" drain to comply with code, and that requires a plumbing permit. Another upgrade that would require a plumbing permit is to switch from galvanized pipes to copper or PEX. Messing with any plumbing behind the walls is going to require a permit. While you may find a little wiggle room with plumbing permits, there is none whatsoever when it comes to electrical work. And that stands to reason. Un-inspected electrical work in a wet environment done by an unqualified person is an invitation to fire, electrocution, fines, and other nasty things. The only exceptions are swapping out light fixtures or electrical outlets (to an existing outlet box). Adding or moving electrical outlets or rerouting wiring requires a permit. Even if you are just swapping out an outlet for a new one, you can't legally put a grounded outlet in an un-grounded box. And you wouldn't want to. Please do yourself a favor and hire a licensed electrician to install properly grounded GFI outlets (the kind that pop off instantly if they detect a short) and keep your family safe. If you have to get one of the above permits, it's probably going to trigger the need for a building permit. Any major bathroom remodel is going to require demolition: the opening up of walls and the removal of old fixtures, flooring, and tile. The type of building permit you need for this type of project is one of the simpler ones to get and is what Seattle calls a STFI or "subject to field inspection" permit. Get tips about these permits and the fee schedule here. Basically, Seattle will issue these for relatively simple projects that don't require a full plan review. You can walk up to the counter, request the permit, and walk out with it the same day. The fees you pay for your permits go partly toward sending inspectors to your home to check your contractor's work. It will be the job of the electrical, plumbing, and building inspectors to make sure all the work is being done to code. If you have been issued a STFI building permit, it's the inspector in the field who is making sure your project is compliant rather than a plan reviewer in the office checking things over before you get started. This saves time and money, but it requires that those working on your project know what they are doing, or it could lead to some costly do-overs. Your contractor will schedule visits by the three inspectors once all the wiring and plumbing are in, but before the new drywall is installed. When the project is complete, you will need another round of inspections. Ultimately, the building inspector is responsible for making sure that the electrical and plumbing inspectors have signed off and that the project meets code. He or she will also check for things like insulation of exterior walls (was it properly installed) and holes between the floors of the house (which can be a fire safety hazard if left open). If all goes well, the building inspector will sign off, and you can rest assured that you have a safe and well-built new bathroom that complies with code. See Also: Why Is Bathroom Remodeling So Expensive? Because bathrooms are relatively small in size, and the cost of remodeling one can be high in per-square-foot terms, some homeowners are tempted to do the work themselves or hire a handyman. DIY is great, if you have the skills and the time. You do still need permits, however. One more reason to avoid the un-permitted route is that no reputable electrician or plumber will want to work on an illegal job. It's common for Seattle building inspectors to be on the lookout for work trucks pulled up in front of houses and knock on the door to make sure the owner or contractor has the proper permits. You can be fined $500 a day; subcontractors face even steeper fines and could lose their license after just a few violations. It's little wonder the good ones choose to avoid that risk. Luckily, following the rules and avoiding fines (or worse) is simple. A reputable remodeling contractor or design-build firm will likely take care of all the details and pull the required permits for you. Working with a reputable company may cost a little more in the short term, but it will pay off in the long term and greatly reduce your risk. And if you want to reduce the cost per square foot of your bathroom remodel, here's a tip: combine it with other projects in your house, like a second bathroom or a kitchen remodel. You'll have a parade of subcontractors and inspectors coming through your door, and it's far more cost effective to have them addressing multiple areas of your home at once. If you have questions about permitting or anything else related to your bathroom remodeling project, we'd be happy to help. Feel free to contact us online or give us a call at 206-782-6959.